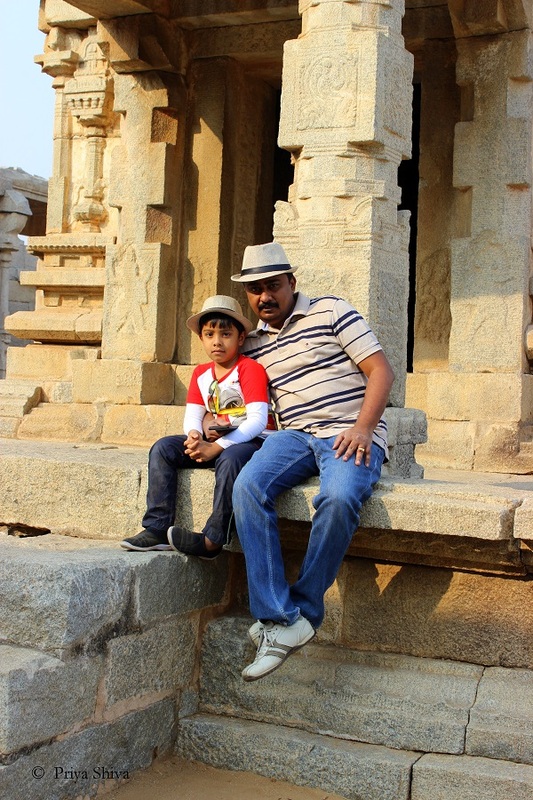 Having visited the Vitthala temple after a long drive bought us to the end of day one in Hampi. After checking into one of the resorts for the night we decided to hire a local taxi the next day so that we could capitalize on the driver’s local knowledge of temples & monuments and also not drive the whole day. 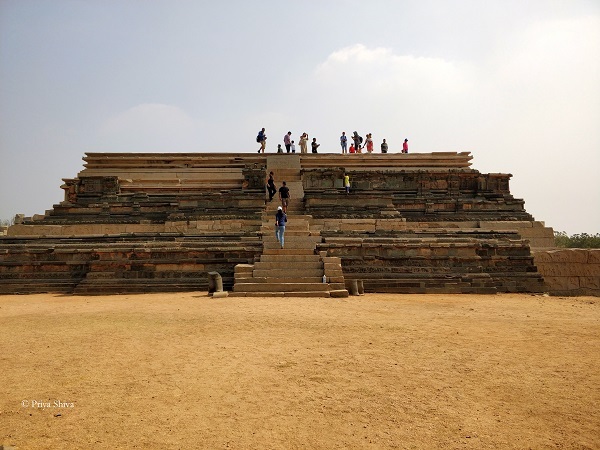 We realized very early during day one, that Hampi is huge and in order to do justice it is impossible without a local guide. We called a few taxi services and they were quoting exorbitant rates. However, while talking to one of the taxi driver we told him we have a car and felt for a round trip of 100 km the prices they quoted were high. The taxi driver however offered to drive us around for the whole day at a paltry sum of Rs. 500 per day. That sounded more logical and hence we decided to use his services for the whole of next day. At the said time the driver reported and after a quick stopover for breakfast outside we started Day 2 of Hampi. The first stop of the day was on the chandrasekhara temple. A small temple dedicated to lord Shiva (though none of the statues of Gods are there). This temple and the reigning deity are believed to grant fruitful results in terms of wealth accumulation and relief from diseases. 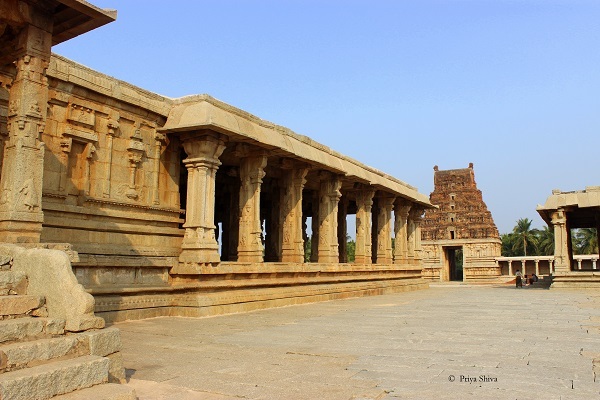 A few clicks were in order though they were not as humongous and attractive as the Vitthala temple. 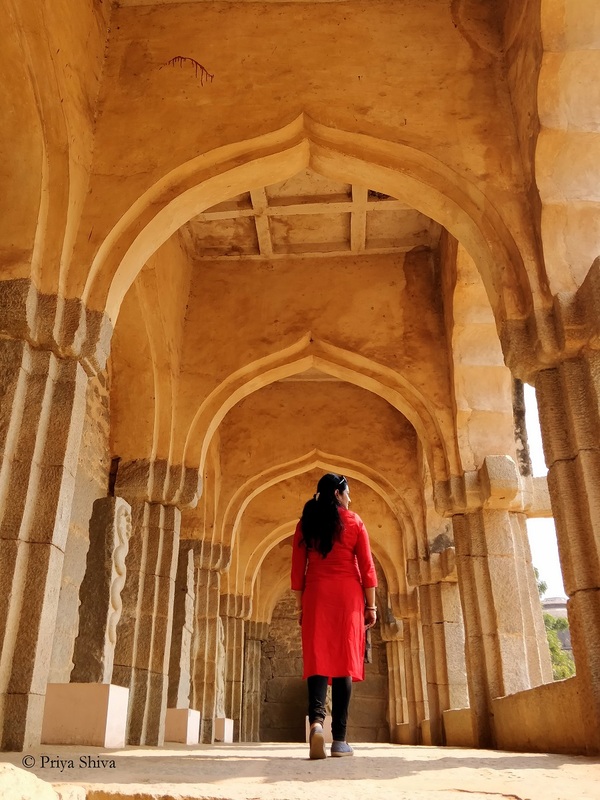 A few kilometer down the dusty road leads us to the Zenana Enclosure and the first stop there was at the beautifully symmetric Lotus Mahal. 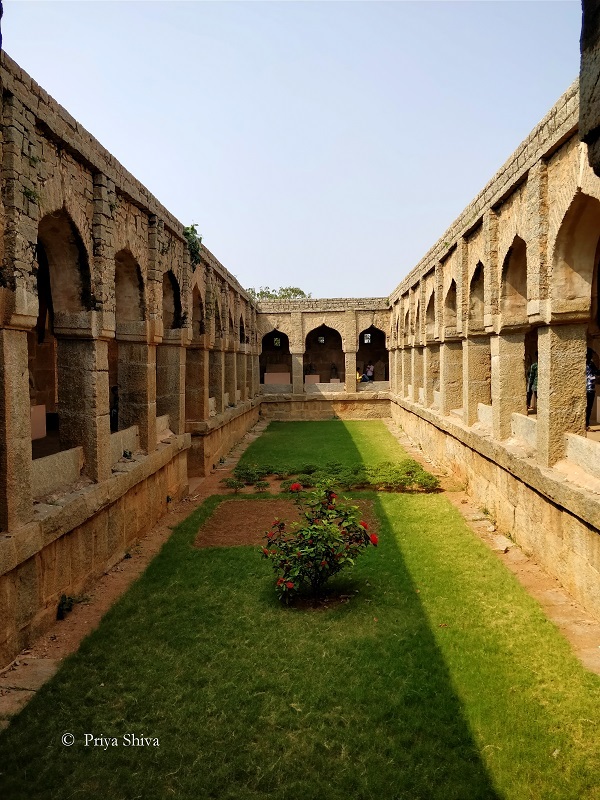 As aesthetically designed communal area for the Queens of the Vijayanagara empire, this place resembles a full-blown lotus and hence the name. This mahal has a mixture of Indo–Islamic architecture and was used by the royal women to mingle and enjoy recreational activities. Behind the lotus mahal are the watch towers that have been used for safeguarding and maintain a vigil on these structures. Passing through the watch towers behind the lotus mahal leads us to the most astounding piece of architecture, the Elephant stable. The elephant stable is located in the area that lies just outside the Zenana Enclosure and was used to host the royal elephants. Each enclosure could host two elephants and the entire structure could have accommodate close to 20 elephants. 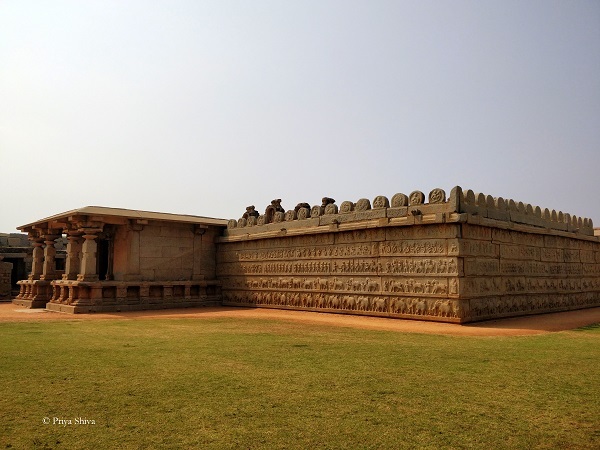 The importance to elephants were given during the Vijayanagara regime is very much evident from the structure built for them. The uniqueness about the elephant stable is the central dome, which is the largest and most decorated among the 11 domes of the building. The other 10 domes represent the Islamic style of architecture. A few yards from the elephant stables are the plain looking building with a rectangular structure, and without any distinctive features. The building has a corridor inside that runs on all sides and has arches at regular intervals. Some people believe that it was actually the quarters of the eunuchs who used to guard the Zenana Enclosure. 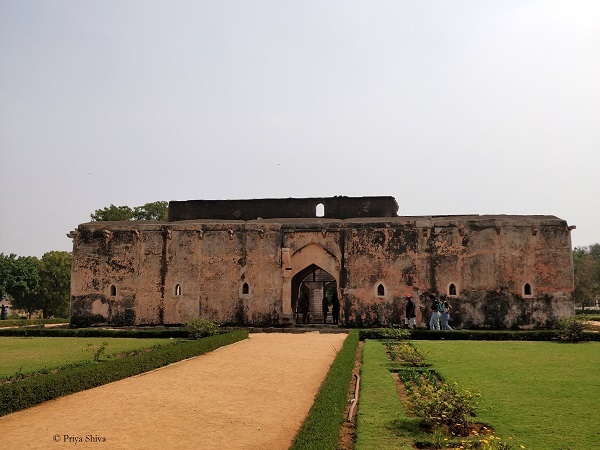 This structure is now being used as a mini museum with some of the destroyed statues, and remains of ruins from the Mughal invasion are kept for the public viewing. After spending adequate time in the Zanana enclosure it was time to move on. Hazara Rama literally means a thousand Rama and refers to the multitude of wall carvings depicting the reigning deity of the temple. 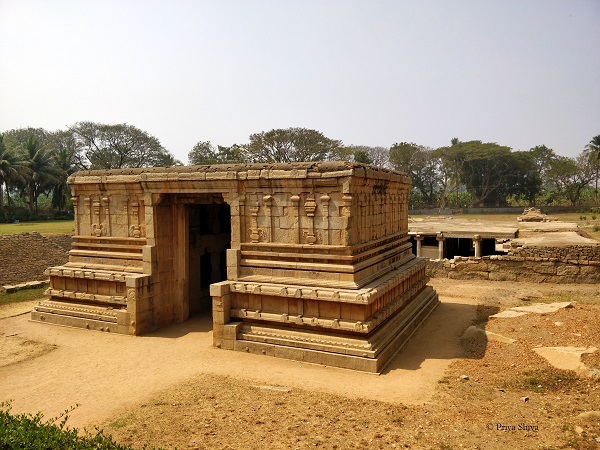 The temple is dedicated to Lord Rama and was one of the private temple and places of worship of the kings and the royal family of Vijayanagara. Further moving on from the Hasara Rama temple we hit upon the Royal enclosure. The scorching heat really was show stopper as it made walking in the sun a little unbearable. However, we realized what a great piece of architecture we would have missed had we given in to the sun and not entered the royal enclosure. First thing that captivates your attention is the Mahanavami Dibba, which is the tallest structure in the area. The kings used this structure as a platform to watch various parades, ceremonies and performances. 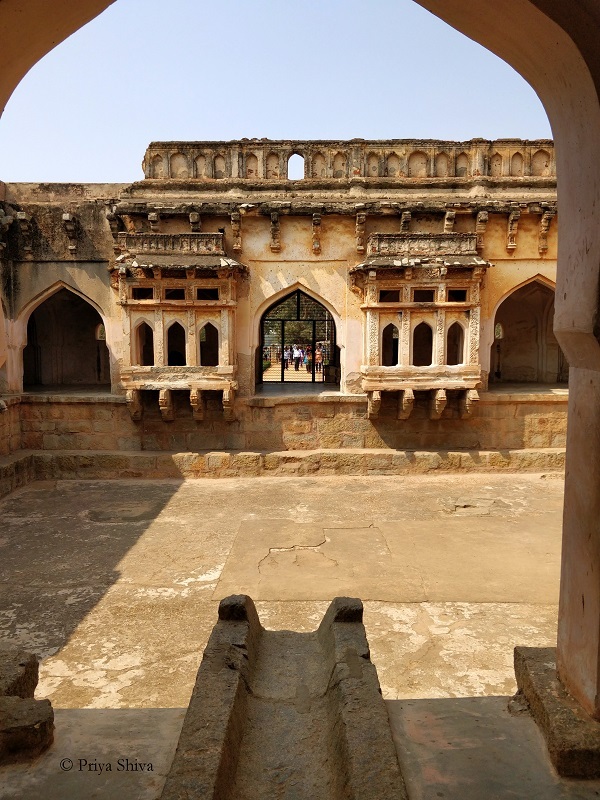 The Stepped tank has 5 tiers each of which have been fitted with steps in a very systematic pattern, this tank was probably used by the royals and for various religious rituals. 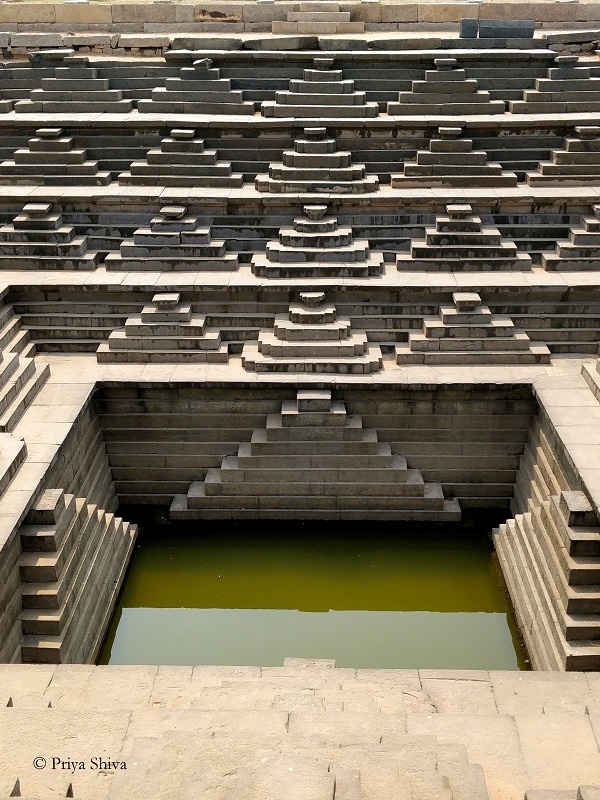 The tank is a standing example of the rich architectural skills of the workers belonging to the Vijayanagara era. 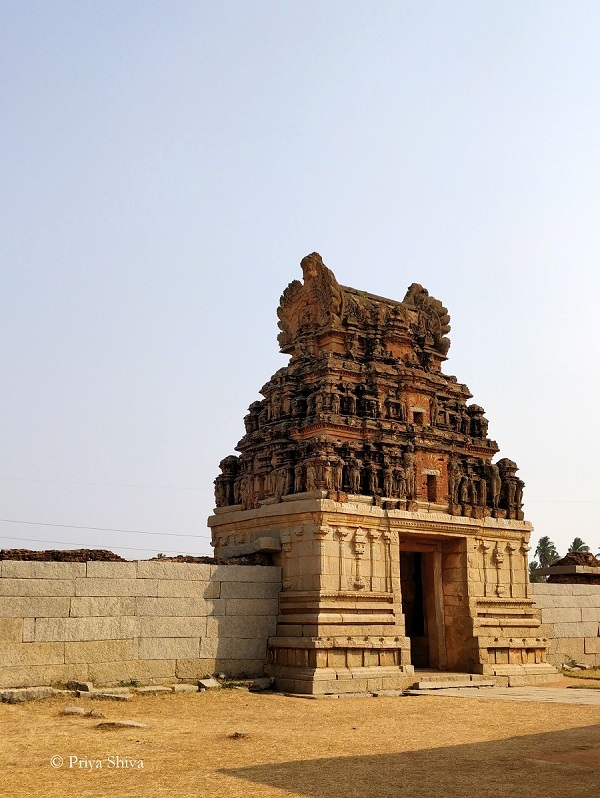 This is one of the most popular tourist attractions of Hampi. 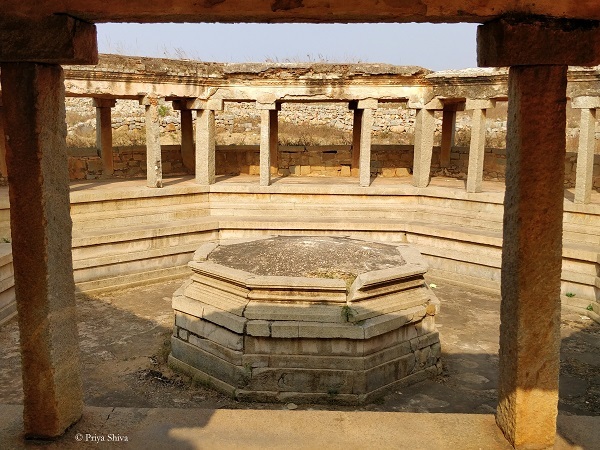 The Queen’s Bath in Hampi exemplifies the architectural excellence during the days of the Vijayanagara Empire. Though named queens bath, history points out that in all probability this was a royal bathing chamber frequented both by the kind & queen. 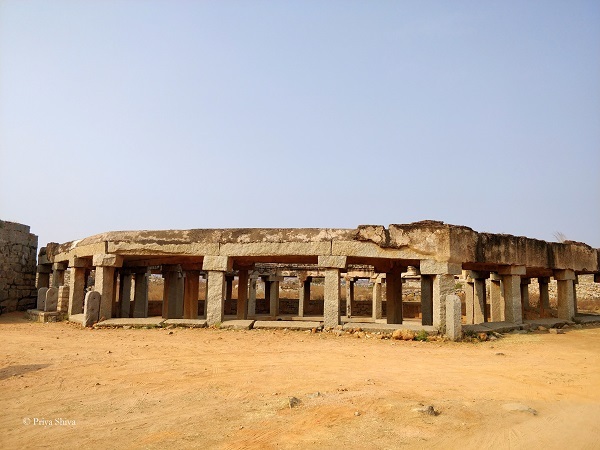 The structure was built during the reign of Achutraya who in our opinion was one of the most creative rulers of vijayanagar. 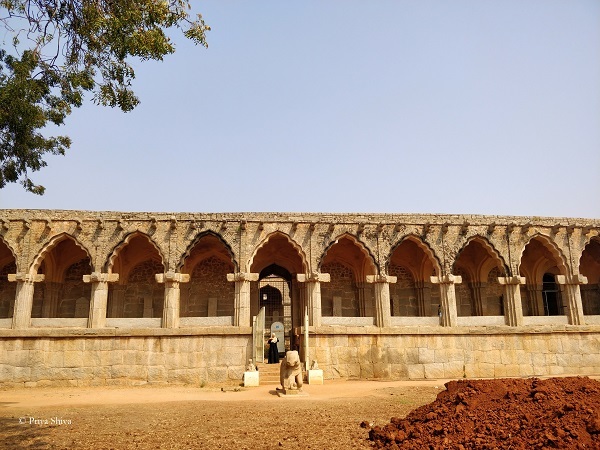 His eye for detail, knowledge of architectural principles and the vision to build humongous structures really sets him apart from the other rulers of vijayanagar at least for us. Moving out of the Royal enclosure we proceeded to visit the famous underground Shiva temple. The ground level has a beautiful structure that leads to the path below the ground, which leads you to the Shiva temple below. Almost all the time the sanctum and the core parts of the temple are under water, restricting entry to the inner areas and a water canal system too is visible around the main temple. 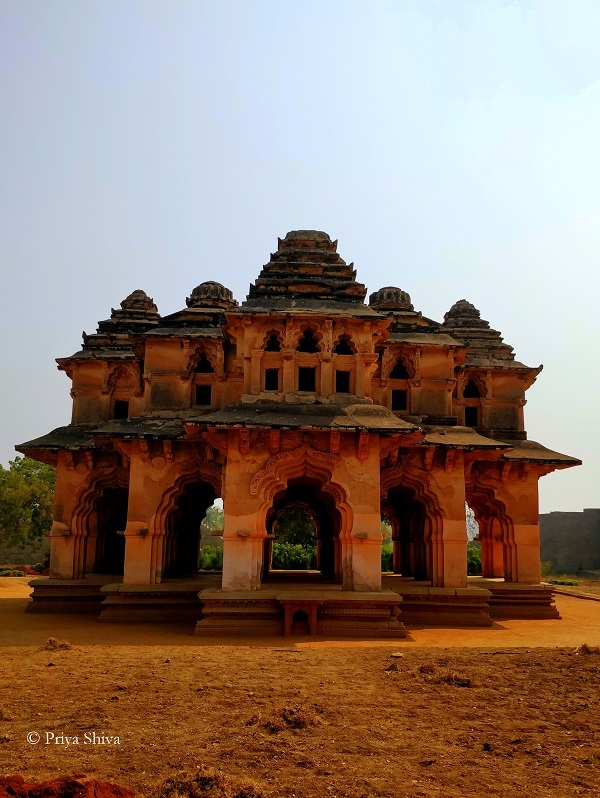 It is not worth missing this temple as this is one of the oldest structures in Hampi and is an experience that none can match. The Virupaksha temple dedicated to lord Shiva has survived through the years and is still pristine amidst the ruins that surround it. 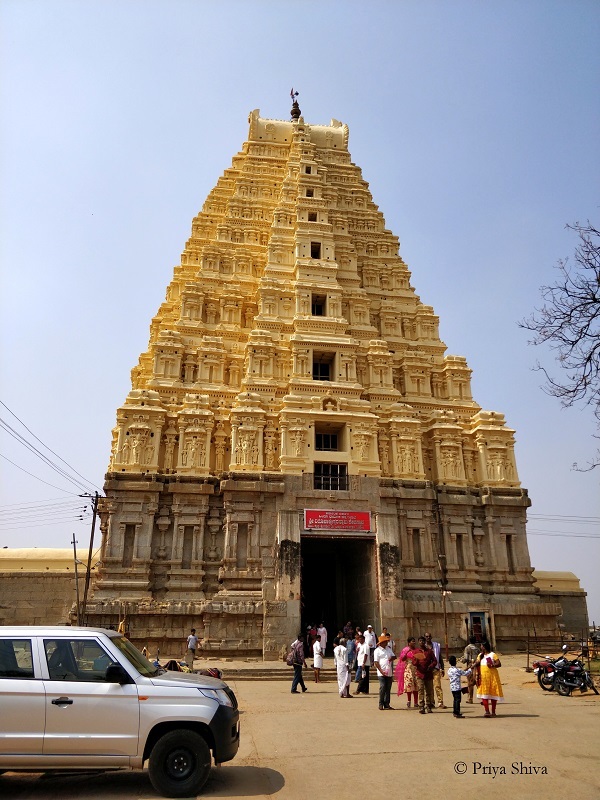 This is one of the few temples in Hampi where the reigning deity is still present and regular pooja is done the idols. A steep climb surpassing the monolith Nandi leads us to the small Matanga hillock. 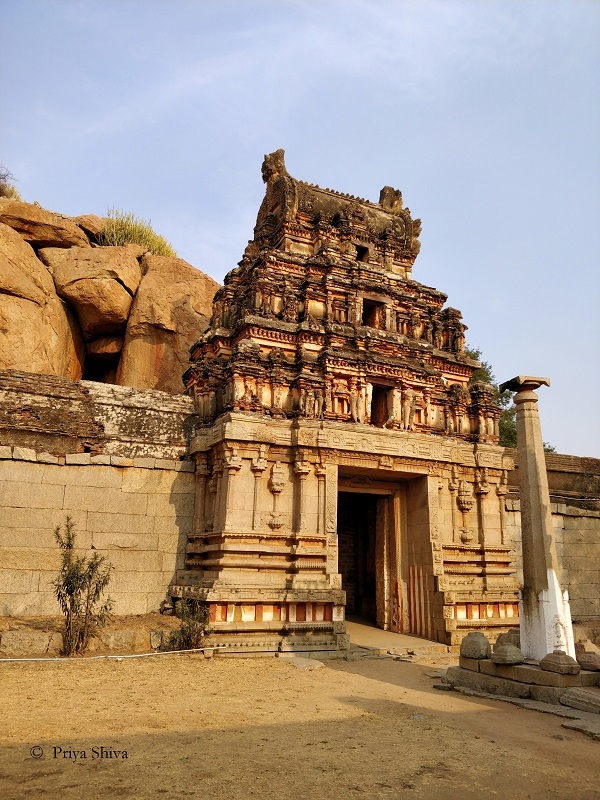 A few minutes trek down this Matanga hill leads us to one of the most splendid temple structure of Hampi. Named after the kind who built it, the Achyutaraya temple is dedicated to lord Thirvengalanatha (a form of Lord Vishnu). This temple is between two valleys and the view from top of the Matanga hill is really out of the world. This temple is in an offbeat location and is seldom crowded. 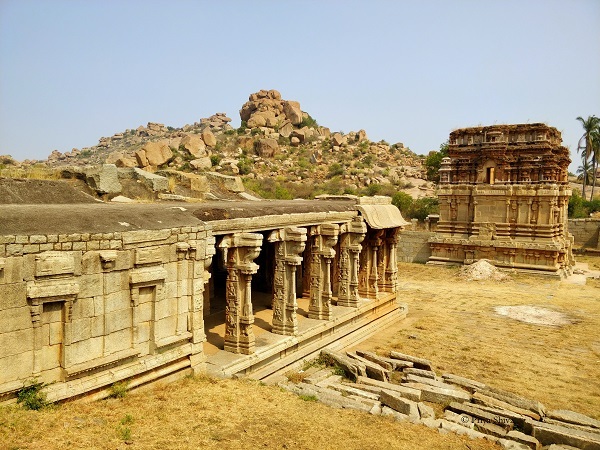 This makes it one of the must visit places in Hampi. Further down the temple is the Achyutaraya bazaar where a full-fledged bazaar thrived and traders from different countries were setting up shops of barter and trade. 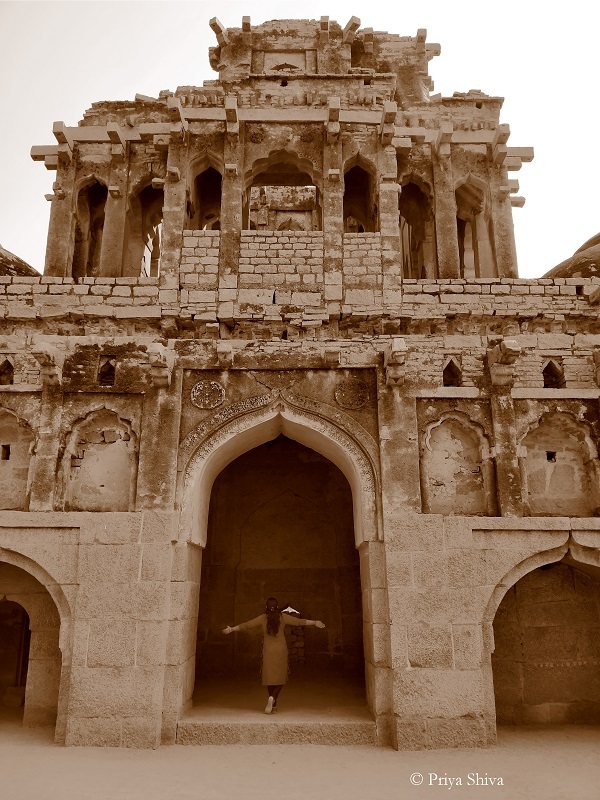 This is also one of the most iconic locations in Hampi to watch a sunrise or a sunset. 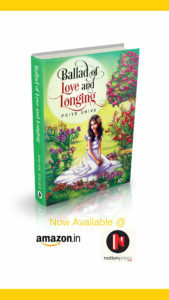 The name Badavilinga is a combination of two words – Badva and Linga. In the local language Badva means poor and Linga represents Shiva. 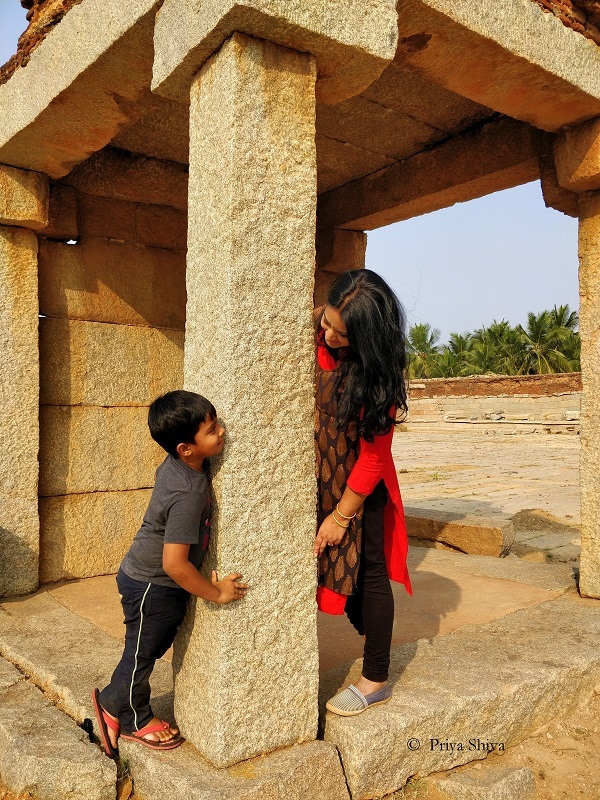 Legend has it that the Shiva Linga placed inside the temple was commissioned by a poverty-stricken peasant woman and is the largest monolithic Shiva Linga in Hampi. 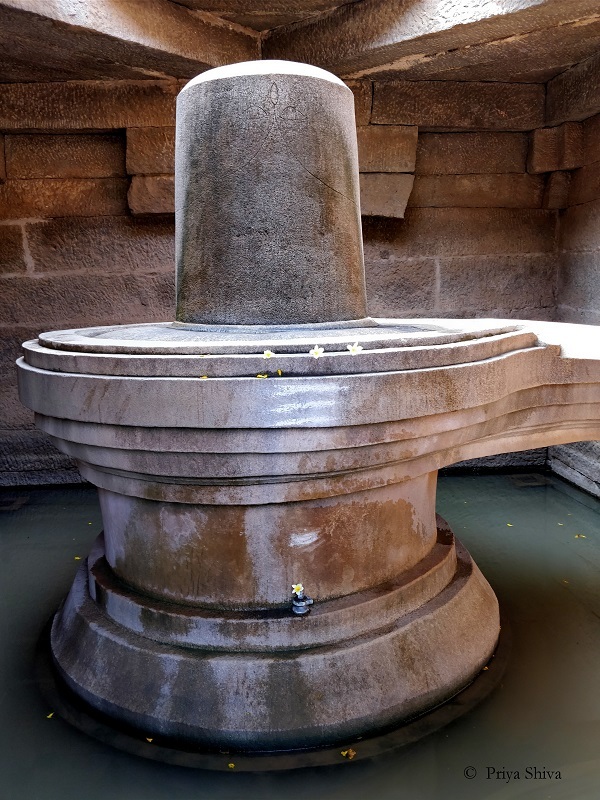 The Shiva Linga has a three-eye mark which depicts the three eyes of Lord Shiva. 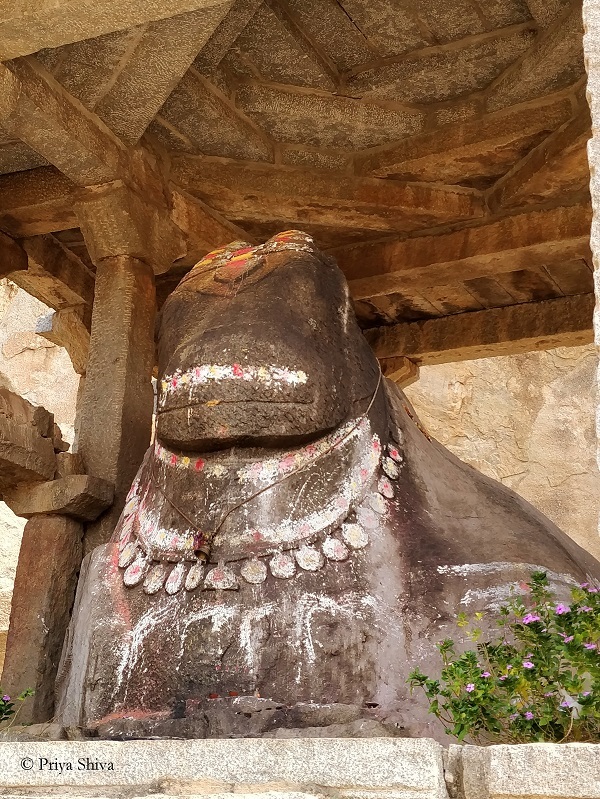 The Lakshmi Narasimha statue is one of the most imposing sculptures found in the ruined town of Hampi and it is the largest monolith statue in Hampi. Lord Narasimha is one of the Dasavathar of lord Vishnu. The statue of Narasimha has a finely chiselled chest and a well-groomed mane. 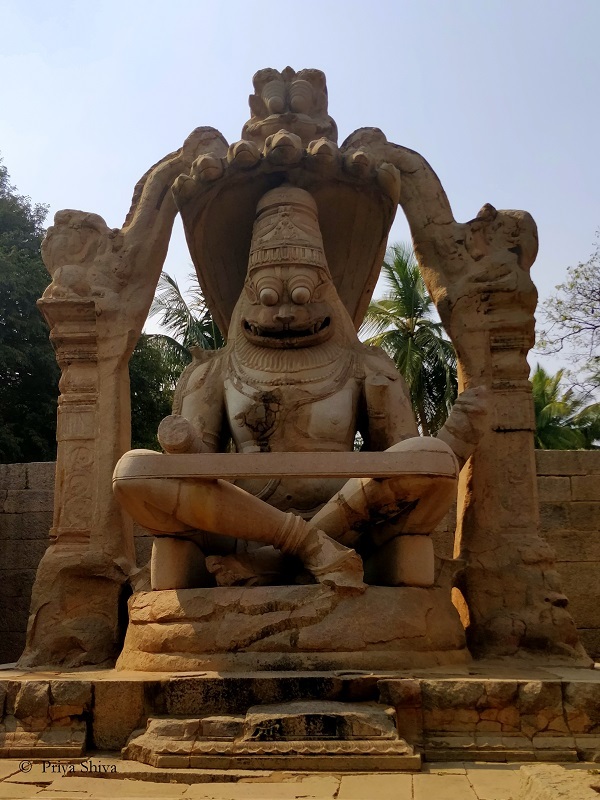 Lord Narasimha is seen sitting on the coils of Adishesha, the king of all snakes, which rises behind him with its seven hoods. Narasimha stands for half human and Half Lion and has a very significant role in Hindu mythology. The Pattabhirama Temple has a unique charm about it though it wears a deserted look. There is no idol inside the temple complex now. 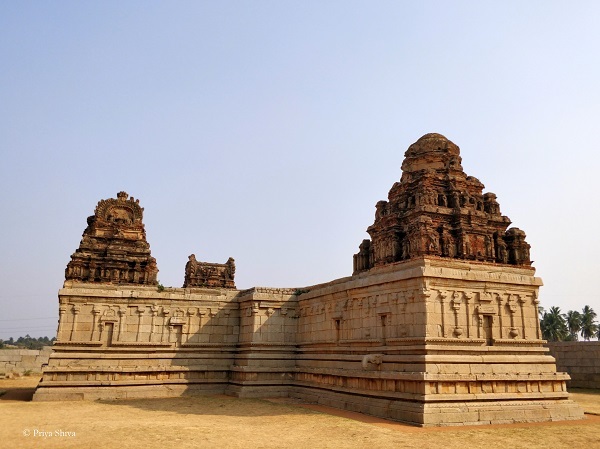 The serene atmosphere of the place and the splendid architecture leave visitors amazed and is again of the least visited temples in Hampi. 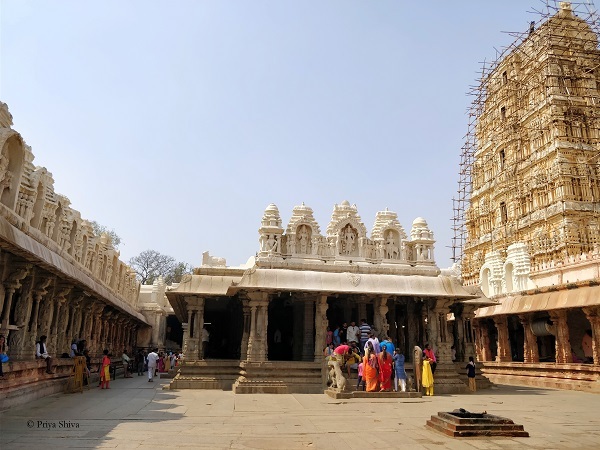 We really loved the isolated location and the emptiness of the temple at this gave us ample time to explore and experience how divine this temple could have been at its peak of glory. 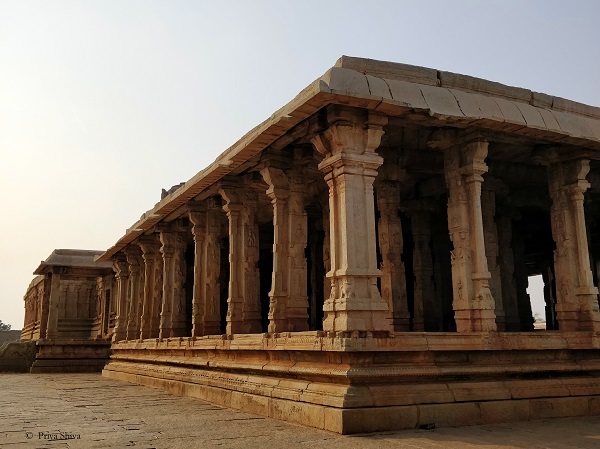 As the day drew closer to night we decided to make the most of the time available in Hampi and pushed ourselves to visit this one last temple. Dedicated to lord Rama, this is the place where lord Rama and his brother Lakshamana had sought shelter during monsoon on his expedition to find goddess Sita. After the monsoon stopped, both the brother along with their gang of vanaras (monkeys ) marched to Lanka to fight Ravana. 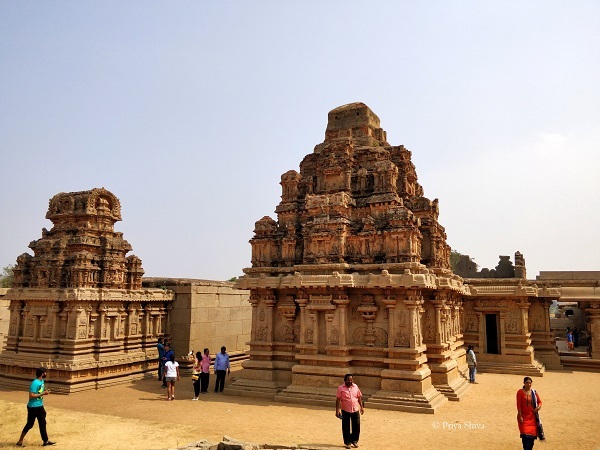 As you can see we almost covered twenty different location in Hampi in just one and a half days. This could not have been possible without a local driver at our disposal and at the end of it there were still a few options which we could not cover. Most missed on the trip was the Darboji bear sanctuary which we felt would have been a good visit but could have easily cost us four valuable hours. 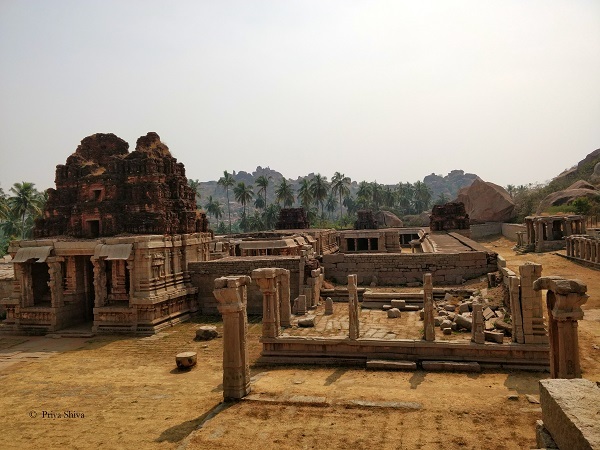 Hampi definitely has enough places to see and could easily make you spend close to three to four days if full justice needs to be done. Having said that we had no regrets as this trip was packed with places to visit and offered us a chance to experience or visit close to 20 different iconic places in just one and half days. 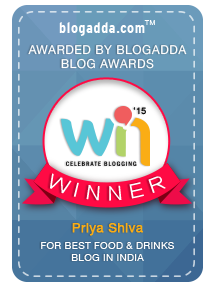 Hi Priya. 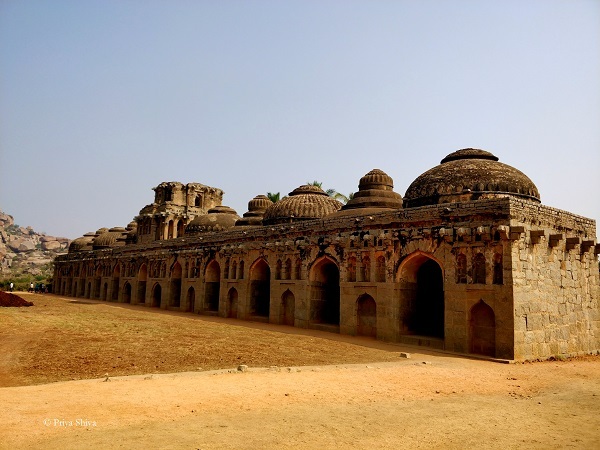 Can you please share the name of the taxi service you used for Hampi and Lepakshi from Bangalore? An awesome review of this place. It great to see that you are with your family and your baby is too cute like you. The place is a historical place it seems! Good to know about this place. Thanks!